The buyer hereby agrees to purchase the puppy “_________ ” from the litter by Chocolate City Bulldogs out of _______ for the price of $ _______. All puppies require a $1000 Deposit on prices up to $3500. Prices more than that require 25% down to hold your puppy. Deposits must be paid by cash, PayPal, U.S Postal Money Order, Western Union,Money Gram, Walmart to Walmart, or Bank Deposits. Remaining Balance of puppies must be paid by 6 weeks old no later. Choice of puppy is determined on a first come (deposit received) first to choose basis. All puppies will be sold as pet homes, unless Chocolate City Bulldogs sells the puppy with full breeding rights. Deposit’s are NON REFUNDABLE. If something happens to your pup, if one is not available from this litter, you will be given first choice of a pup from the next available litter. If you change your mind and do not/can not get puppy you forfeit your deposit. ALL SHIPPING COSTS are buyer responsibility. This includes Vet Certificate, Flight crate, and actual shipping costs. All shipping costs must be PAID IN FULL, at least 14 days prior to shipping date. Buyer will pick up puppy by the time it is 8 weeks old, otherwise there will be a $35.00 a day boarding charge, plus any other expenses, unless agreed upon and noted by Seller in writing. Two (2) weeks or more with no attempt to make pick up arrangements, and buyer forfeits puppy with no option to obtain another unless noted by the seller in writing. The seller agrees to furnish the buyer with the necessary health information, including all shot and worming records. The AKC registration will be supplied as soon as it becomes available. 1. To be in good physical condition for the first 48 hours after the time of delivery. The buyer agrees to have the puppy examined by a veterinarian within 48 hours after the delivery time for a complete physical examination. If a veterinarian finds the puppy to have a contagious disease or to have a serious physical condition other than a bacterial infection such as coccidian or giardia which is easily treated. (Certain examples of health issues that are commonly associated with the breed of the dog like cherry eyes, skin issues, and heat sensitivity will not be covered under our health guarantee. Also we will not cover any health issues that are caused by obesity. Such as issues dealing with your puppies joints if they are to heavy. English Bulldog puppies must grow at a proportionate rate and over feeding (free feeding) will cause joint issues. If we find the puppy to have issues caused by obesity their health guarantee will be non-void ). The seller will replace the puppy with another puppy of comparable or better quality. The seller reserves the right to a second veterinarian opinion at the expense of the Buyer. If the puppy is not examined by a veterinarian within 48 hours after delivery time, the above guarantees are no longer in effect. No money will be refunded. 2. To be free of any inheritable diseases that causes death or serious impairment of vital functions in the puppy until such puppy is one (1) year of age. If such an inheritable disease is documented by a veterinarian and presented to the seller with sufficient supporting evidence, the buyer will be entitled to a replacement puppy of comparable quality. The seller reserves the right to a second veterinarian opinion at the expense of the seller. 3. To be of sound temperament, that is, to be neither shy nor vicious as to render the dog an unfit companion. This guarantee of temperament is effective only until the dog reaches one (1) year of age, if sold as a puppy, and is contingent upon reasonable proof that any defect in temperament is not the result of lack of proper care or training on the part of the buyer. 4. Puppy has received at least 1 vaccine and wormed 4 times. No replacement will be offered in case of Parvo. 5. 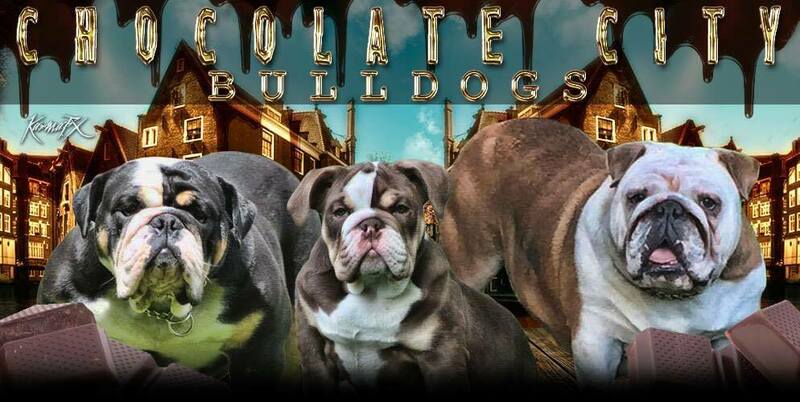 Chocolate City Bulldogs does not guarantee Breeding quality. 1. To use the kennel name “Chocolate City Bulldogs” as the kennel prefix in the registered name of the dog. 2. In the event that the dog is later sold, or otherwise transferred from the possession of the buyer, for whatever reason, the seller will have the absolute right of first refusal to repurchase the dog for a sum not to exceed the original purchase price. The buyer and seller agree that this is the full and complete agreement that exists between the parties for the sale of this dog. Any agreements made prior to this are considered incorporated herein and any modifications made to this agreement shall be made in writing or such shall not be effective.